Welcome to another great day of Food for the Fourth! If you missed my other posts, let me catch you up! I began with Main Dishes, then added some Salads, Sides and of course, delicious Desserts. Later on I will be sharing some No Bake Desserts for the Fourth too! These Cool, Refreshing Drinks are not only great for the 4th of July Holiday, but can be made all summer long. This Frozen Blue Hawaiian can be made with or without alcohol. Either way, it’s a sweet, cool refreshing drink. We make these Slushies with Ice Cream alot during the summer. My youngest loves to whip up a batch to enjoy with his friends during their squirtgun fights. Put a couple hands full of ice in a measuring cup and fill with cold water to measure 2 cups. Add to blender. Add drink mix and sugar. Add 4 cups ice and blend until smooth. Add ice cream if desired. 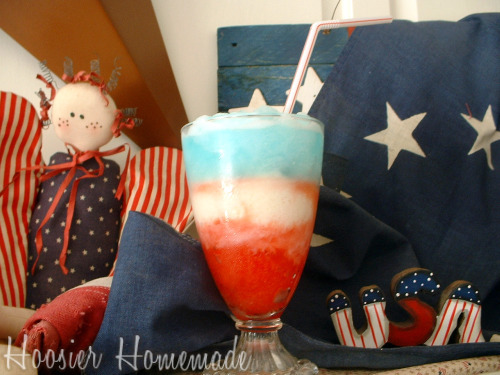 This 4th of July Drink is very easy. I bought star ice cube trays at Walmart, they were only $1 for 2, and filled one with red Kool-Aid and the other with Hawaiian Punch Berry Blue Typhoon. Place a few ice cubes in a glass and slowly add Club Soda or a clear soda, like Sprite or 7-up over. Can I just come to all your parties?! Too fun! @FishMama, Sure! I love company! *sigh* I love you. Would it be inappropriate for me to propose via blog comment? 😉 It’s been so hot lately, those look like heaven! @Cheryl@SomewhatCrunchy, LOL, you are too funny! Those drinks look delicious. I love the idea of putting drinks in the star ice cube tray. That is a really cool idea. How fun! Thanks for the recipe and linking to Tempt My Tummy Tuesday. 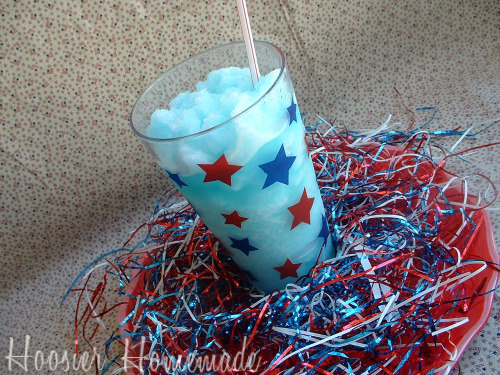 This drinks post is my favorite of all the 4th ideas! I just love each beverage. And they’re SO beautiful too. I love the star ice cubes. The Kool Aid is a great idea, and bet its tatsy too. 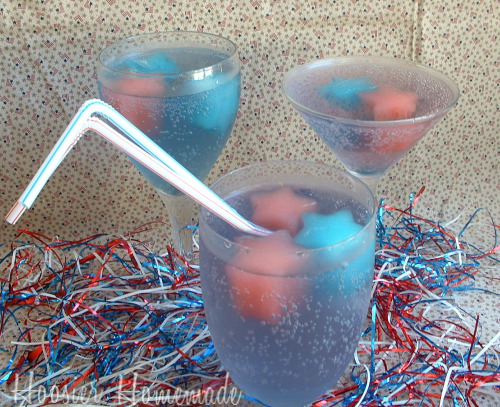 I’ve tried the patriotic look by freezing a blueberry and half of a strawberry in the ice cubes, and added a red, white and blue striped straws. Got them both at Ikeas. All of your drinks look so yummy (and refreshing!) Love them! The drinks look very refreshing with or without alcohol and very festive to boot! We might have to break out our blender. love the novelty ice cube trays! I make up batches of punch and freeze in ’em. Then when I want a treat…anytime… I pour some diet Sierra Mist over it and feel less guilty! Thanks for sharing the drink recipes!